On September 15, 1907, during the dark, misty hours just before dawn, a 27-car freight train and a 4-car express passenger train collided head-on, killing 26 people and leaving 30 or so others seriously injured. 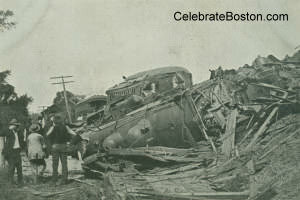 Two of the passenger train's cars were completely destroyed, and both locomotives were reduced to scrap metal. The scene could have come from a disaster movie, with the wreckage spread all over the immediate vicinity. The cause of the accident was due to mistaken train orders, especially with the passenger train being 40 minutes behind schedule. The passenger train, traveling about 30 miles per hour around a curved bridge, did not see the freight train until it was only 250 yards away, which was too late by then to stop in time. A thunderous crash and the sound of metal creaking accompanied the wails and shrieks of people as both locomotive cars fell over to one side of the track, still interwined. "…Then the wreck settled together, and for a moment there was a dreadful quiet. Men crawled from the wreckage; the locomotive crews appeared, limping from where they had fallen as they leaped from the cabs, and a flare lamp began to flicker about the indiscriminate heap that had been two locomotives. A dim little group worked savagely about the heap for a moment, and the tiny glow that had begun to mount up disappeared hissing. Women stood weeping in the second-class day coach. Men gasped at each other, in all the absurd half-dressed, open-mouthed comedy of a fear that [did] not even dare to ask what [had] happened. A trainman, wringing wet, ran through the cars. People in the sleeper on the rear end put their heads through the curtains, asking wondering questions. They joked at first about how hard the train stopped. A man in pajamas begged [for] whiskey for [a] brakeman, cut badly by being flung through a glass door, and a dozen clawed at the porter's heap of shoes. Nobody in the sleeper had much idea that a bad accident had occurred." "The light was growing all the time, and the bewildered passengers of the second class coach clambered down to the roadbed and watched the brakeman running back with red lanterns, through the dusk of the bridge and round the turn. What seemed a huge cliff against the rosy east towered ahead of the cars. There was no locomotive; just a column of steam. There were groans and cries, and trainmen and passengers climbed side by side into the awful shambles of the forward day coach. They trod on bodies in the gloom, and clawed their way among the jumble of broken seats, splintered timbers, and human wreckage. Women and children could be heard crying and moaning all around, and men making queer strangling noises trying to be still." "…A pale wreck man ran up from West Canaan, asking for his mother. He was Benjamin Griggs of West Lebanon. Early this morning, before the dawn, he had gone with his mother to the train for Boston, and had put her aboard, going back to his bed again. An hour later the "caller" knocked at his door and he had to rise and join the wreck gang to hurry to the disaster. Among the horrors of the car of death he searched with a white face, and coming out said, 'There is one there with clothes like hers, but I can't recognize her face.' Presently the sheriff, C.N. Murray of Canaan, who had hurried to the wreck in an automobile and had taken charge of the means of identifying the dead, brought to Griggs a handbag of leather. It had been taken from the grasp of one of the dead. 'I got her that,' said Griggs, and opened the pocketbook within. It contained beside some money a careful memorandum of what the good mother had used Griggs' month's pay for. And the man whose livelihood is among the horrors of railroad wrecks, who had looked on his mother's mangled body without flinching, broke down utterly at the sight of the little scrap of paper." Another man of 78 years old, one of the survivors, was also found standing and refusing to leave the immediate vicinity of where his train car was wrecked. His hair and beard, grayed by age were both plastered with red. His name was John Barrett of Manchester. Along with him for the train ride were his wife, daughter, and a niece. He refused any of the officers' offers to help him along for treatment. In just a blink of an eye, he was suddenly alone in the world. Only when he made sure that his relatives were truly dead did he allow himself to be escorted away from the scene. Aside from the obvious tragedy, several miracles had shown up. Talman H. Rieder, the secretary and manager of a big rubber company was one of the first out of the rear end passenger car. He was in the thick of the work, chopping, sawing, prying and helping. This was a big contrast to the other males who just stood around, shocked. Also, not one of either train crew, except for one brakeman named Ryan, was seriously injured. While some of them—baggage men, conductors, and engineers—jumped off the train at the last second, most of them in the train cars that were wrecked who were able to escape, oddly did not remember how. One other lucky coincidence that saved a few more lives was the crashing of the heavier, more solid, baggage car into one of the passenger cars. It barreled its way into the car but instead of crushing it outright, it slid up on it at an angle, leaving some space at the front where people fell forward upon impact, still injuring them but saving their lives. Sadly, the cause of the accident was determined to be an error in a dispatch message sent from the Concord office. Two train numbers were mixed up and the fatal train did not receive correct orders. Also, tragically, if the weather had been clear and not foggy, the two engineers would probably have seen each other's locomotive headlights, and the collision may have been averted completely.